On this week's episode of the Lunch and Learn with Dr. Berry we celebrate two accomplishments. Our 100th episode & a feature with the Culinary Doctor. The 100th episode here on the podcast is a milestone that we can not overlook. I want to take the time out & thank every single one of you who have ever listened to an episode or gave a recommendation to a friend/family member about the show. It has been such an amazing journey joining this world of podcasting & I am glad that there is an audience out there who are ready to take control of their health and are willing to allow me to help that movement. Now for the 100th show we have a special guest Dr. Lauren Powell, The Culinary Doctor who is going to talk about the role nutrition has on our health. March is National Nutrition month so I thought what better way to educate the Lunch and Learn community by bringing on a physician who underwent additional training in culinary medicine. 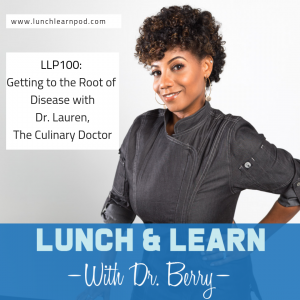 On the episode Dr. Lauren Powell goes through her journey to becoming the Culinary Doctor, why as physicians we need to stress the importance of healthy eating and the mindset needed to make that shift. 1. 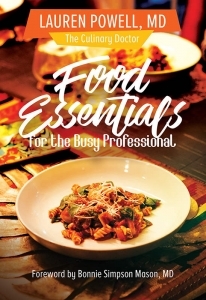 Why you need Food Essentials. This is a great book & resource for those who are always on the go and can't seem to get over the mental block of proper nutrition. In this book you will learn how the Culinary Doctor uses six key principles to stay ahead of her nutritional goals. 2. What's in store for The Culinary Doctor? Dr. Lauren talks about some of the amazing opportunities that have been afforded to her as she continues to pursue her passion. Ranging from speaking opportunities, live courses & cooking classes. How important is nutrition for weight loss? What side item should be included with every meal? What is the beverage of choice for health excellence?